The beginning of spring signals the return of frogs to local vernal pools, streams, and wetlands. Frogs are amphibians, which means “double life,” because they live part of their lives on land, and part of it in water. That means they are extremely sensitive to polluted water and the disappearance of habitat, like wetlands. You’d be helping not only the following frogs, but an abundance of other wildlife by keeping water clean and protected. Even if you don’t see the frogs, you might get a glimpse of their eggs in nearby ponds. 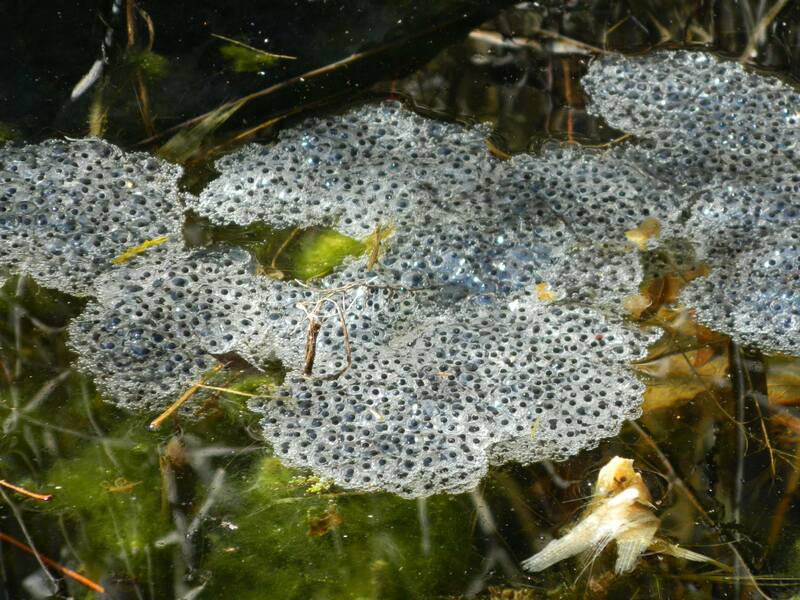 This is a wood frog egg mass at the NWF HQ pond in Reston by Dani Tinker. This frog has been eliminated from 70% of its previous range, and now is found almost exclusively in California. At one point in time, over 80,000 red-legged frogs were harvested annually for their legs. They are now federally listed as threatened. You can help conserve these frogs by protecting local wetlands and spreading the word that non-natives should not be released into the wild. California red-legged frog by Beth Pratt. When the temperature drops below freezing, wood frogs freeze solid without dying. During this deep hibernation, their breathing and heartbeat stop. Nearly 70% of the frog’s body water gradually turns to ice. You can help wood frogs with a backyard pond. They’ll visit during the spring to mate and lay their eggs, after which they will return to the woods. We have them here at our NWF Headquarters pond, and they are fun to watch and listen to. Wood frog by Dave Huth. Wood frog photographed at NWF’s HQ pond in Reston by Kaila Drayton. Their scientific name is Pseudacris crucifer, the second part referring to the “X” on their backs, which can assist in identification. Spring peepers prefer wooded areas near water, where they mate and lay eggs. Keep an eye out for them at night, as they are nocturnal. Even if you don’t see these little frogs, you’ll likely hear them in early spring. Spring peeper by Dave Huth. Spring peepers by Dave Huth. Both the northern cricket frog (Acris crepitans) and the southern cricket frog (Acris gryllus) are members of the tree frog family, but do not live in trees. The southern cricket frog can jump upward over 60 times its body length, the equivalent of a person jumping up a 38 story building! You can cater to cricket frogs by providing shallow water with plenty of vegetation. Take a look at how to create a marsh in your yard. Cricket frog by Dave Huth. I can’t call myself an Oregonian without including the Pacific chorus frog. It’s the smallest and most commonly seen and heard frog not only in Oregon, but much of the west coast of the United States. The call of male Pacific chorus frogs is often heard in the background of Hollywood movies. They can be rather noisy at certain times during the year, something to consider as you decide on the placement of your backyard pond. Pacific chorus frog by Dave Huth. You can attract amphibians to your yard, assist with citizen science, build a pond, create a backyard marsh and more. Protecting clean water, especially wetland habitats, is another critical way to help frogs and amphibians thrive. Learn more. Create a haven for amphibians in your yard by transforming it into a Certified Wildlife Habitat!